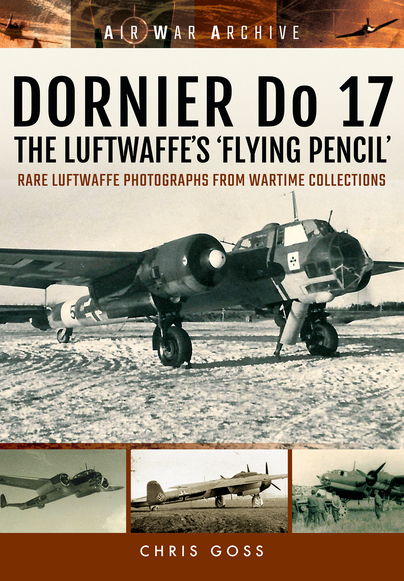 You'll be £6.00 closer to your next £10.00 credit when you purchase DORNIER Do 17 The Luftwaffe's 'Flying Pencil'. What's this? For the first three years of the Second World War, the Dornier Do 17 was the Luftwaffe’s principal light bomber. Designed to be fast enough to outrun contemporary fighter aircraft, the Dornier helped to spearhead Germany’s Blitzkrieg as Hitler’s armies raced through Poland and then France and the Low Countries. Until its withdrawal to secondary duties in 1941, the Dornier Do 17 served in every theatre of war involving German forces. This included the invasion of the Balkans and Greece as well as the battle to capture Crete. After suffering heavy losses at the hands of Fighter Command in the Battle of Britain, the Do 17 was employed in Operation Barbarossa, the invasion of the Soviet Union in 1941. The Do 17 was withdrawn from frontline service later in 1941 but continued to be used by the German Air Force in various roles until the end of the war, including seeing service as a glider tug and in the defence of the Reich in 1944 as a night fighter. In this compilation of unrivalled images collected over many years, and now part of Frontline's new War in the Air series, the widespread deployment of the Dornier Do 17 is portrayed and brought to life. This book is a compilation of decent wartime images nicely reproduced over 136 pages, in a slightly larger than A5 soft-back format, that complements the volumes already published on the Bf 109, He 111 and Ju 88. Recommended to anyone with an interest in World War II, the Luftwaffe in general, or the Do17 in particular...and especially if you're building any of the Do17 variants....you will not be disappointed! A curious and interesting visual documentation for modelers, amateurs and researchers. The subject of the Dornier 17 is interesting in itself, though I suspect that it will hold a special attraction for all those who with an interest in the aircraft involved in the Battle of Britain. So plenty in here for the WW2 aviation historian and a lot of super detail for modellers, along with many ideas for potential diorama scenes to recreate. A welcome addition to this Air War Archive series which is growing very nicely and deservedly popular.